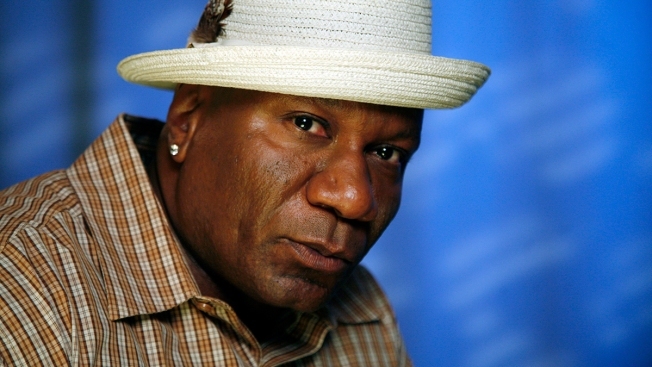 This Aug. 10, 2010, file photo shows actor Ving Rhames in New York. "Mission: Impossible" star Ving Rhames says Los Angeles police once held him at gunpoint inside his own home after police said a neighbor called 911 to report that a "large black man was breaking into the house." The 59-year-old African-American actor, who is promoting the new sequel Mission: Impossible - Fallout, made his comments on The Clay Cane Show on Sirius XM Friday after being asked about racism. He said that earlier this year he was watching ESPN in his home in Santa Monica one afternoon, wearing nothing but basketball shorts, when he heard a noise coming from his backyard. He thought the source of it was his two English bulldog puppies running around. Someone then knocked at his door. "I get up, I open the door, there's a red dot pointed at my face from a 9 millimeter," he said. "And they say, 'Put up your hands.'" Santa Monica PD told NBC News that their officers do not carry laser-guided service weapons. The actor said that he complied and stepped outside with his hands up, then saw a few cops and a police dog. He said the police captain recognized him because their sons competed against each other in high school sports games together and apologized for the mistake. When the officers and actor went to the neighbor's house, the neighbor denied saying a "large black man was breaking into the house." Santa Monica Police Department told NBC News on Sunday that the incident didn’t occur earlier this year but on July 26, 2016. “In our actions responding to what would be a residential burglary, holding a potential suspect at gunpoint would not be out of the normal,” Lt. Saul Rodriguez, the executive officer for Santa Monica police’s media relations unit told NBC News. "My problem is, as I said to [the cops], is what if it was my son and he had a video game remote or something and you thought it was a gun?" he said. "Just like, I don't know, Trayvon [Martin] had a bag of Skittles."